Its Valentines Day again ! And as love it is that makes the world a romantic paradise for all mankind, it is but obvious that such a day will be celebrated by all, particularly in the US. Valentines Day is not just for lovers. It is for all relationships that have tenderness and affection as its core values. The celebrations therefore manifests itself in several delightful ways : purchase of gifts, jewellery, clothing, candies, toys, cards, flowers, and of course an evening out at restaurants for a grand meal befitting the occasion. Hence, it is not uncommon to see couples frantically searching for the appropriate restaurant and ambiance on social media and the internet days in advance. As a restaurateur, be sure to advertise well in advance, of your menu, settings, ambiance and events fo the day. Make all efforts to make the day one of the best days of the year both, for your customers as well as for yourselves. Sit with your team and plan suitably. 135 million Americans (53%of the population) will spend around $30 billion. Approx 62% of men and 45% of women are expected to spend on retail goods. Age group 25-34 will spend the highest with 64.3%, while 56.3% of spends will be by women. Takeaway restaurants such as GrubHub will spike sales on Sushi rolls,Shrimps & Indian snacks by a good 15%. Approx 39% consumers will go for online purchase through their Smart phones and Tablets. Digital Menu Board Best For POS: That digital screens and menu boards are the in-thing today in restaurant menu promotions is undisputed. You may take the assistance of this leading restaurant menu template websites for designing and making the aesthetics best for this event. Devise videos and playlists based on your menu: An entertaining food menu entices all, particularly the passersby, who could be your customer. If you have grill or barbecue items, all the better in displaying them. Make the menu special: Valentine’s Day being a special day, the menu should be special too. Sit with your chef and plan in advance. Give catchy names for your dishes, or present rose petals while planting a plate. Create space for branding your menu items: Branding goes a long way in establishing the repute of the restaurant and making known to all the superior quality of its menu items. Offer something Extra: Like pastries in the shape of a heart, an extra helping of ice cream. Leave a souvenier in all your tables so that customers remember you. Make them feel special by offering a free glass of champagne, dessert or a complimentary dish. Plan a musical event with the menu: You can arrange for soft music or hire a live band for the day. See what the competition is doing. Encourage couples to step up and dance. Organize games and contests to engage customers. Attract the singles too ! : Although Valentines Day is all about couples, friends, family and loved ones, the singles should always be kept in mind. Offer on meals, drinks, desserts can set them on the mood for a good time. Market the day well: Promote your menu and events for the day on social media platforms : distribute pamplets and fliers : cultivate your regular customers so that they bring in their family and friends. 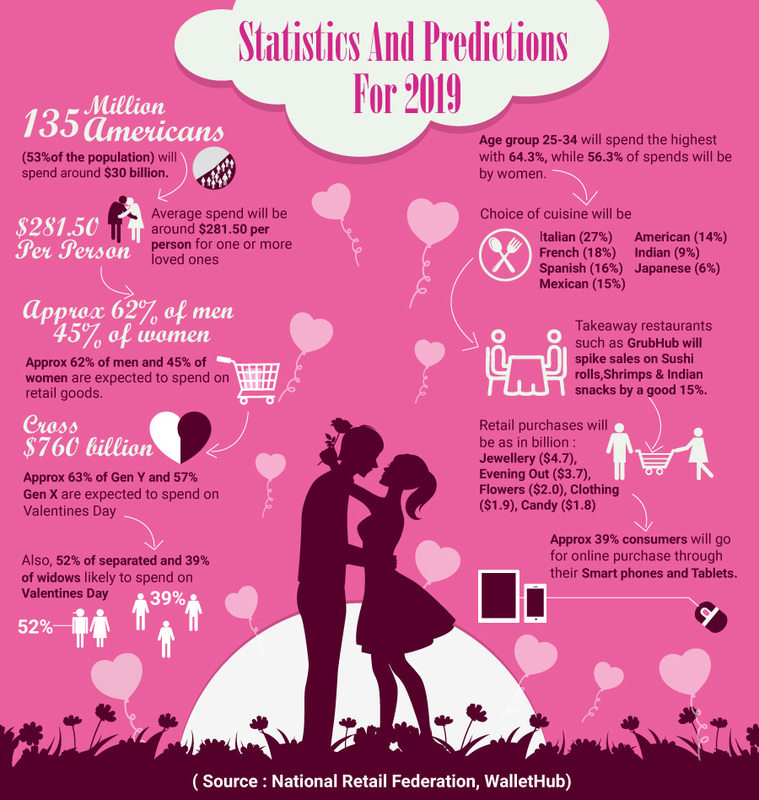 Valentines Day remains one of the biggest eating out holidays for Americans, and as the statistics indicate, the restaurant faternity should cash in on the bonanza, and make every attempt to maximise customer satisfaction and profits.